The Armarkat B5701 57 inch cat tree is a classic and very sturdy model which is made from very attractive looking pressed wood and can support the weight of a cat up to 40lbs. The Armarkat B5701 stands at approximately 4 feet 7 inches tall and can be placed either against a wall, in a corner or simply left free-standing. The B5701 cat tree condo has scratching posts which are covered in good quality sisal rope and are great for your cat to really sink his claws into and use to climb upon. The shelves are covered in a beautifully soft ivory colored faux fleece material, which is easy to clean and tougher than it looks. You can either vacuum or brush it clean. The faux fleece is not as ‘smooth’ as the faux fur that you may have read about on other Armarkat cat trees, but it’s also not as ‘coarse’ as carpet. Overall, the Armarkat B5701 has proved to be a hit with both cats and their owners. Many reviewers commented that this model had everything that they were looking for and that the price was very reasonable. The only thing that some reviewers thought that they might have preferred, would have been to change the faux fleece covering for something thicker, like carpet. But they also rationalised that whilst they may have preferred something thicker, their cats didn’t mind the faux fleece at all…so they didn’t worry about it. A large number of reviewers also spoke about any concerns they had over the sturdiness of the Armarkat cat tree. Before their cat tree had even arrived, many of them thought that they would have to secure it to a wall in some way. However, once their cat tree arrived and they had assembled it, they soon realised that they had nothing to be concerned about at all, as it is a very sturdy cat tree with a good solid base. There were other customers who thought that the measurements of the Armarkat B5701 meant that it could be too bulky, but once their parcel had arrived and they managed to put it together, their new cat furniture proved to be in the right proportions and also the cats found it comfortable and very inviting. Other comments were made by reviewers who had several cats. Going back to how sturdy the Armarkat B5701 really is, several reviewers who had as many as 4 or 5 cats, were pleasantly surprised that the cat tree didn’t wobble…even a little bit. You should be made aware that there are also several different sizes of this particular model to choose from, so when you go to order, please make sure that you choose the height and size that you desire. If you would like to see the different sizes available, you can click here. The scratching posts on the B5701 are covered in good quality sisal rope and are great for your cat to really sink his claws into and use to climb upon. The shelves are covered in a beautifully soft ivory faux fleece, which is very hard wearing but easy to clean. You can either vacuum or brush it clean. 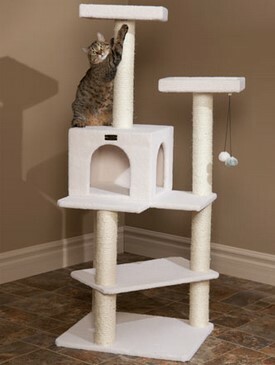 This is a cat tree condo which can be placed either against a wall, in a corner or simply left free-standing. The scratching posts are covered in good quality sisal rope and are great for your cat to really sink his claws into and use to climb upon. Even though the amount of positive customer reviews out-weighed the negative reviews by far, you can’t really ignore what they had to say. There was one reviewer in particular who quite rightly pointed out just how weak, or poorly made, the cat toys that came with this cat tree are. This particular customer’s cat was pretty boisterous and shredded the fluffy ball in seconds, but then began to eat the particles of string, became very ill and had to be taken to the vet. So, he/she wanted future buyers to be aware that if you have a particularly boisterous cat as well, not to bother with the cat toys that come along with this cat tree, but to look at other cat toys that are made much stronger and attach them to the tree yourself. There were also reviewers who thought that the Armarkat B5701 was not stable. However, once a few of these customers tightened the fittings a little more they realised that the cat tree was a lot more stable and just needed to be more aware about checking the bolts from time to time to see if they needed tightening again. The customers who didn’t tighten the fittings sent the cat tree back for a refund. There were also some reviewers who didn’t like the faux fleece and said that they would really have preferred carpet. There were also negative reviews about the colour of the faux fleece as some customers didn’t like the shade of ivory, some others said the little “cubby”, aka the cat condo, was too small for their 11lb+ cats and then some also commented that the instructions that came with the cat tree were hard to follow. Is The Armarkat B5701 Good Value For Money? Looking at all 600+ reviews, of which 490+ were all 5 star ratings, we think that this particular is still very good value for money. The price of the B5701 can vary from one store to another. However, Amazon tends to have the lowest price on most of their products…plus the shipping deal adds even more value since this particular cat tree weighs approximately 44 pounds and Amazon offers free shipping. …then this model is for you…or rather your cat. 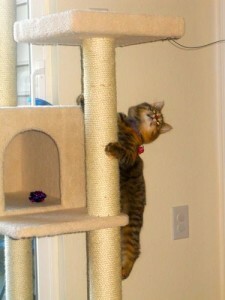 However, if you think that you would prefer to have a cat tree with carpet on it rather than faux fleece (like this cat tree), or perhaps you would rather have a completely different design, then you may like to consider something like the Molly and Friends “Step Stool Sleeper” which is handmade and comes ready-assembled. The sisal scratch posts were probably used the most. The owners had great pleasure watching their kitties enjoy their new toy. 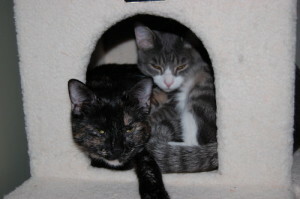 But most importantly, the cats were very content with the Armarkat B5701 cat tree condo.